Ford is the most popular brand in Finland in 1963 and 1964. 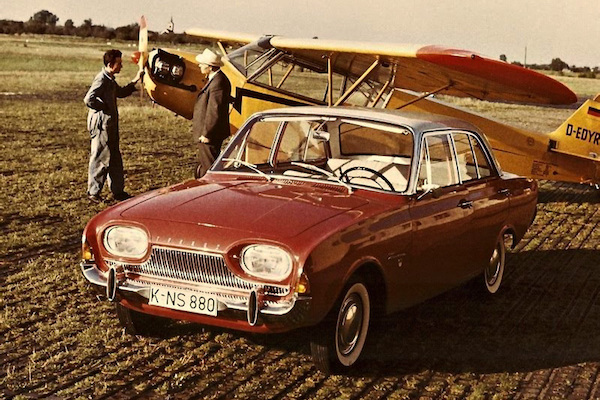 New car sales in Finland gain 28.1% in 1963 to reach 52.225 registrations, and there is a new brand leader this year: Ford, up three spots on 1962 to snap the pole position thanks to deliveries surging 89% to 15.1% share. It is followed by Volkswagen up 50% to 14.5%, Fiat up 7-fold to 7.2% and Simca up 140% to 6.9%, meaning the Top Four carmakers all frankly outpace the market this year. Leader from 1959 to 1962, Moskvitsh implodes 46% to 5th place in 1963, with Skoda (-50%) also struggling but Wartburg (+7%) managing a positive result. Volvo (+85%) enters the Finnish Top 10 for the first time since statistics began in 1956, Neckar lands directly at #11, Datsun is up 6-fold on its inaugural score to end 1963 just outside the Top 20 with 1% share and we also welcome Toyota (2 sales) and Suzuki (1 sale). 1964 is another year of spectacular growth for Finnish new car sales at +57.2% to 82.107 units. The podium remains unchanged, with Ford (+68%), Volkswagen (+32%) and Fiat (+85%) in the lead. Opel soars 147% and five ranks to snap the 4ht place while Moskvitsh (+43%), also growing slower than the market, manages to stay 5th. Both Austin (+132%) and Morris (+107%) leap into the Top 10, the first UK brands to rank inside the Finland Top 10. Volvo (+55%) and Peugeot (+41%) stay inside the Top 10 while Wartburg (-2%) and Skoda (-19%) are knocked out of it. Datsun (+294%) continues to advance and is now at #14 with Isuzu (#42) the new Japanese carmaker for the year. Full Year 1963 and 1964 Top 65 All-brands ranking below. Finland September 2012: Nissan Qashqai now #1 year-to-date!